I have a dream that one day every person in this community will take charge of their own health care and strive to feel as good as possible. That we will all tune in, listen to our bodies, and choose wisely our exercise, nutrition, and self care. And as we strive to be our healthiest and most introspective selves, we will teach by example these fundamental skills to our future generations. I have a dream to use MOVEMENT as a cornerstone habit (def. a habit that starts off other good habits) for improving overall health and wellness. As we strive to solve our movement puzzles and see the effect on pain, function, and performance, we learn to shift habits and patterns in all aspects of life in ways that are awesome and inspiring. I will never tire in efforts to blend the best of rehabilitative medicine, fitness, neuroscience, and holistic healthcare in my practice and advice, and offer this knowledge to the community in ways that are fun, engaging, motivational, and practical. To promote a thriving Movement Labs presence in the community with workshops and events focused on healing and thriving through quality movement. Continue my individual physical therapy practice with an increasing focus on babies, children, pregnant and postpartum mamas, Motor Vehicle injuries, and athletes of all ages with stubborn repeat injuries and tricky movement puzzles. Provide in-depth on-site training programs in the workplace, so I can do what I love (analyze movement, teach practical skills) in the place where we spend a lot of time and where injuries, aches and pains occur every day. Create fun and socially relevant ways to spread the MovePT Movement. This will likely include video, Stick Man cartoons, and me acting goofy to illustrate my points. Continue to teach and engage on a professional level with my colleagues, to improve the quality of health care and patient interactions on the ground level. No biggie, right? Just a few things on the list. May you all dream big and be inspired by your path. A special shout out to Dr. Martin Luther King Jr. on this national day of service. In Superhero Pose. Feel the Power. 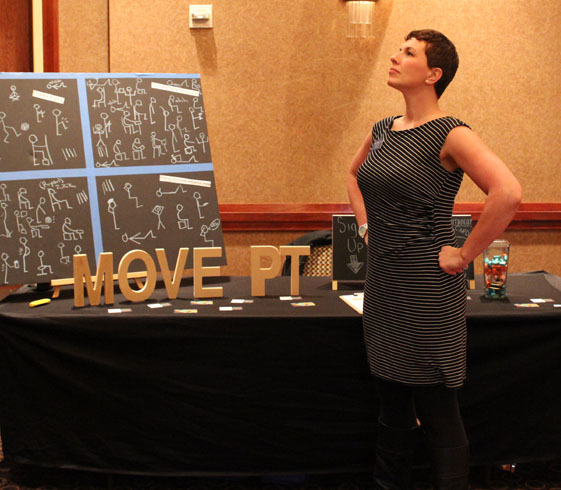 Dr. Jeni Gall is a licensed Physical Therapist, Certified Orthopedic Movement Specialist, professional level educator, Credentialed Clinical Instructor, and owner of MovePT in Vancouver, WA. Learn more about MovePT at www.MovePT.org.